President Obama and John Kerry and Congress are making a big mistake by constantly working at odds with Russia at this time in history. Russia is in a position to be a natural ally of the US, and we should not chase them off. Russia wants to be an ally of America. America strongly needs Russia as an ally. There are just a few small things getting in the way of bringing these two shy nerdy dance partners together. You and I, dear reader, may become the sources for good ideas to get the two children together. All of us need to examine how old and unreliable our prejudices against Russia are. 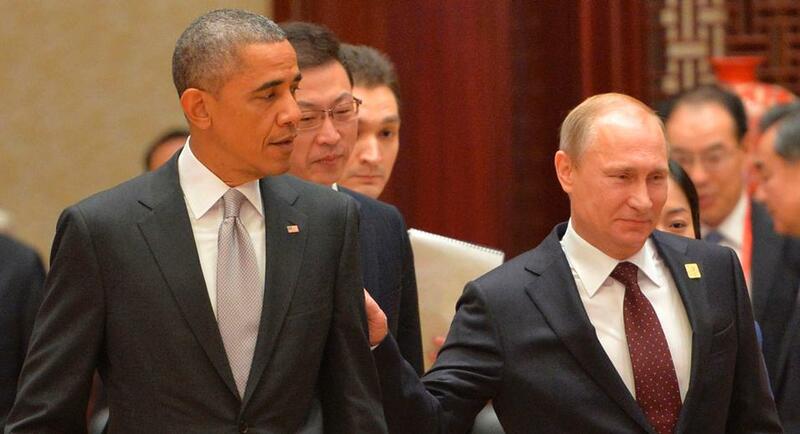 There are many who will say restoring good relations with Russia means being soft on Communism. Most, though, assume that the two countries have such different philosophies they can never be friends. Me, I say it’s two children throwing sand at each other. There may be some things that need to be changed, yet I say all those changes are of little consequence and easily resolvable (others would differ.) And, best of all, Russia and America don’t have to agree on everything. If restoring good relations meant Americans and Russians have to behave and think alike on every issue, then nothing will ever happen between these (or any other) nations. I respectfully refuse to give up my dearly beloved Constitutional government and my Free Enterprise Capitalism. Hear me roar! So we’re not seeking to be drinkin’ buddies, or to intermarry royal houses. So why not cooperate where possible with our new ally Russia and make some concessions that over time won’t mean much anyway. Being an ally is a very specific relationship, defined over centuries by many nations. There must be trust, yet it is not necessary to fully trust the Russians; any more than they will ever fully trust us. Lying and keeping secrets are strong Russian cultural imperatives, scholars say. Lying to a greater or lesser degree is probably nearly universal across cultures. The degree of lying is determined by the culture’s definitions of what words and actions are to be unmentioned or kept secret. We can live as allies alongside Russia’s culture as long as we fully understand the imperatives embedded in their culture. What about our own culture? If your social crowd decided to eject all who’ve told a lie, would you remain a part of the group? Suppose you decided to associate only with those who’ve never told a lie; how many friends would you have left? Heck, we may even find some things we admire and want to emulate about Russian culture. In Russia now, the country is no longer our “Communist enemy in the Cold War.” It’s time we made common cause with a nation which is a natural ally of the United States NOW, in the twenty-first century. The Cold War was in another century, and ended about 25 years ago. It now exists only in the pages of history; and what we think and feel about Russia should not be weighted with what is only a fading memory. As a former cold warrior I JUST CAN’T BELIEVE I’m saying all this good stuff about Russia. It was difficult for me to even admit to having the views I just wrote. Yet the truth is that Russia is not the same Communist monolith it used to be. Right now Russia IS a natural ally of the United States. So in order to stay true to my current observations about the world, I had to SQUEEZE OUT many, many memories and angers; and admit that many pages of history, while true, do not represent the current world situation. The rest of this discussion is about two specific issues between Russia and the United States. The first is the Ukrainian situation. The second is the war in Syria. I have already written three blogs concerning the Ukrainian situation. I still stand by the positions I took. You can read them at https://mcgeepost.com/2015/02/06/ukraine-obamas-vietnam-war/ and https://mcgeepost.com/2014/04/25/time-to-divide-the-ukraine/. About half of the blog at https://mcgeepost.com/2014/03/07/some-national-borders-may-not-mean-much/ is devoted to the Ukraine and Crimea. Given current world events, it’s time for these positions to be reinforced and strengthened. My favorite is “time-to-divide-the-Ukraine”, which is heavy on geography and history. Full disclosure: I have never been to the Ukraine or known anyone from there. I know about their situation because I take an interest in European geography and history. I singled out the Ukraine mostly to illustrate the US-Russian conflict which needs to be resolved. The United States needs to as a matter national policy give up any position regarding the Ukraine and its future; and withdraw any and all support to the country other than humanitarian. We must accept the obvious: that the Crimea is right now a part of Russian territory. The US is not the world’s Keeper of Order; and the Ukraine is not a member of NATO. We have no real national security interest in the country. Let the Ukranians and their neighbors sort things out on their own. Once the United States has withdrawn having any position regarding the Ukraine or the Crimea, then it follows that the sanctions and embargo against Russia must be lifted immediately. An international effort then must be made to coordinate economic issues and limit mutual losses and avoidable clashes. Consider that Bashar al-Assad in Syria may not be the very worst person in the world. Russia’s interest in this country and its leader may be because Putin sees Bashir al-Assad as a man of his own style; and that Putin sees the usefulness of the geographical alliance. The United States needs to as a matter of state give up any position regarding Syria and its future; and withdraw any and all support other than humanitarian. We are not their nanny and they are not significant to our national security. Let the Syrians and their neighbors sort things out on their own. The national security interest of the US, in the area which includes Syria, is to destroy ISIS and other fanatical terrorist jihadists. Once we have no national position on Syria, we can cooperate with Russia both militarily, and as partners, in attempting to defeat the deadly armed extremist killers who at this time infect so much of the Middle East. If Saudi Arabia, as an example, wants to overthrow Bashar al-Assad, let them do it with their own people and money. If the Saudis in anger decide to raise oil prices too high, the US and Russia have the ability to flood the markets with reasonably priced oil and gas. Actually, I’m not convinced that dirt-cheap oil is in anyone’s best interests. But that’s another story. To get a true perspective on the war in Syria, let’s go back in history to the American Civil War of 1861-1865. The total population of the United States was about 32 million people. Our internal civil war lasted for about five years. All the most advanced weapons of war were deployed by both sides in the conflict. According to http://www.civilwarhome.com/casualties.htm , at least 620,000 Americans died from all causes during our internal civil war. The Battle of Gettysburg was fought on July 1-3, 1863, three years into the war. There were more than 51,000 dead on both sides during that single three-day engagement. Would the current administration in 2016 call it slaughter, or honor? Grant’s Wilderness Campaign extended from May 1 to June 30, 1864. There were more than 61,000 Federal soldiers killed. There is no record of rebel casualties, so I’ll estimate low at 30,000. This comes to more than 91,000 dead during that campaign. So in a period of two months, and in three days, more than 142,000 Americans were killed. The level of savage slaughter was beyond imagining, right here on our own home shores. Yet all agree this conflict was necessary. The present population of Syria is about 22.5 million. Their internal civil war has lasted now for four and a half years, with no end in sight. According to all estimates, just over 200,000 Syrians have died from all causes during this internal conflict so far. So the Syrian Civil War is really not so different in size, scope or purpose than the American Civil War, 1861-1865, except that the Americans were a much, much more bloody bunch of fighters. We here in the US could and did kill, in two months and three days, 142,000 Americans, seventy per cent of the total number of people the Syrians have killed in four and a half years! If you narrow your look only to the three-day Battle of Gettysburg, the US could and did kill in three days twenty-five per cent of Syria’s total numbers. Whether you may like Bashar al-Assad or not, he does head the forty-year long legitimate government of Syria. His government has done a reasonable job of providing utilities, education, food distribution and modernization (except when both sides conduct a siege??). I’m not sure we here in the US have the right to try and force the country into democracy. We’ve recently seen how really well that worked in Egypt and in Iraq, where many long for the return of the dictators. When you put them side by side, Abraham Lincoln was seeking to retain throughout the land his country’s 73-years established form of government; just about the same as is Bashar al-Assad. The two countries at their respective times were roughly the same in size and degree of development. Lincoln, though, was much more willing and ready to kill his countrymen for the cause, and he did so without compunction. It’s probably only in retrospect that we know for certain Abraham Lincoln was one of our greatest presidents. ← Gun Control? Ban Guns, Better Ban Cars Also.